Working with Robin was a great experience. He was extremely helpful and thorough. He answered all of our questions during his presentation before we had a chance to ask them! My husband and I are very happy with our purchase and feel comfortable knowing that we will not have to worry about our care in our old age. Robin was quick to get back to me, provide me with valuable information and insightful thoughts that will affect the decisions I make about long term care. Robin was thorough and offered choices to consider about plans. From the beginning we could tell Robin had a strong grasp of the financial factors involved in long term care. We have family members who have worked in that field for years but seeing the statistics on cost and the real possibility of financial ruin was an eye opener. He didn't twist arms, just presented the facts and surveyed a number of plans to find the one which fit us the best. We would recommend his services to anyone. Robin truly has the best interest of his clients in mind. 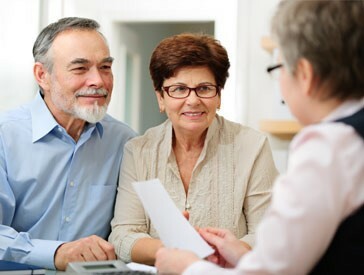 He is extremely patient and lets the clients set the pace in making the final decision that they are comfortable with. Robin was "very" professional and non-pushy in his explanations and followup for LTC Insurance. He gladly showed comparisons of each of my inquiries with what I eventually bought. I urge other teachers, government workers to carefully consider what he has to say. It was a pleasure doing business with Robin. Robin is very knowledgeable about long term care. He is not a "pushy" salesperson but he listens to your needs and then advises you on your options. I felt very comfortable with his suggestions and sincerity. I now feel better knowing if I have long term care needs , my children will not be stressed and burden. Invest in your future now, baby boomers are living longer!!! Thank you Robin for your caring spirit. If we had known about Robin Wing years earlier, we might have been covered all this time. He is friendly and patient, with a comprehensive knowledge of the world of LTC. We wholeheartedly recommend him. Thank you, Robin, for your clear explanation of all the facets of long term care insurance. You demonstrated a friendly manner as well as patience in answering our many questions. You walked us through the process with complete ease preparing us for each step including the phone interview. We didn't feel pushed into making a decision which was greatly appreciated. Your service was excellent. Thank you. Robin Wing has been very helpful in helping me on the Long Term Care insurance process. He is very friendly, knowledgeable yet not pushy. This is something that most insurance advisers do not have. I would recommend any one to talk to this guy. Good job Robin!! I think anyone would enjoy working with Robin. He has proven a consummate and knowledgeable professional who knows his "stuff" inside and out. I have certainly been pleased with the work he has done. I would recommend him to others who are looking into this type of product. Robin, Thank you for being such a indispensable long term care solution specialist. You have all the tools, knowledge and options to guide your clients in finding just the right solution to a subject that none of us want to talk about but know we need to. You make the decision much easier. Thank you Robin, for helping me navigate the "long term care" process! I've appreciated your patience and the fact that you openly welcomed and answered all my many questions. I also appreciated learning everything I needed to know through your very visual and interactive format. I'm not "computer saavy" but you made the process extremely easy. Making decisions about insurance can be daunting, but your knowledge, guidance, and reliability made me feel comfortable the whole way through. I've been recommending you to friends who, like me, had not (until now) thought about the importance of obtaining long term care insurance! Thank you, Robin, for helping me find a Long Term Care insurance policy. The process was amazingly easy. Robin provided very pertinent and timely information. He presented me with three options and recommended one of them. He also helped me prepare for the telephone interview, which went very well. I am pleased with his services! It was a pleasure working with Robin regarding Long Term Health Insurance. The session was very informative and enlightening. Long Term Care at least with us was on the very back burner. There are always better things to spend money on or things you would rather not think about. We realized after the information session that the financial commitment would be relatively small compared with the benefits that could possibly be provided for us in the future. We feel like we are protecting our children and not unnecessarily burdening them with the responsibility for our financial care in the future which puts our minds at ease. Robin was fantastic and extremely knowledgeable and has a great deal of expertise in LTC. Thanks for your help. You answered all of our questions promptly and made the entire process quite simple and speedy. We will tell our friends. Robin has the heart of an educator. He clearly and patiently explained long term care insurance in an interactive and visual way that allowed us to immediately ask questions which he promptly answered. We recommend LTC Financial Partners and Robin Wing to our family, friends and neighbors not only because we know what we have purchased, but also exactly how we have prepared. If we have questions in the future, I believe that Robin will be very willing to answer them. When our New York Life Insurance Company decided to cancel our University of Florida Alumni group long term care policy for all of us Alumni, we found Robin Wing who lead us through the process of finding a new insurance policy at a fair price. Robin is very professional, and I have recommended him to other Florida alumni clients. The Florida Insurance Commissioner is investigating the New York Life cancellation. We had been discussing long term care policies for some time due to the issues faced by both our families. Working with Robin was easy. He explained everything thoroughly and we were glad to work with him. I would be glad to pass his name onto others considering this valuable insurance. Robin Wing did a great job walking me through the application process for long term care insurance. He followed up with me frequently and has always been available for any questions I had. He is professional and friendly at the same time. I will recommend Robin to my friends who may be looking for long term care insurance for themselves or a loved one. Robin, thank you for keeping me on your reminder list for such a long time. I was, as you know, very busy and it is easy to put off getting to the really important things when daily responsibilities must be handled first. I definitely knew that I should protect myself for the future, but if you hadn't been so patient and helpful I certainly would not have gotten the application in. Thank you for your help. I started on my policy for long term care with Robin Wing and was very pleased with the experience. Just get a cup of coffee (it takes a while) and Robin will lead you painlessly through the process. Within days of Robin's initial phone call in response to my request for information on long-term care insurance, I was well on my way to making this important decision. His patience with my computer glitches, his clarity in explaining different plans, and his willingness to work with both my husband and myself in answering questions, helped to build a viritual relationship. Trusting that Robin was knowledgeable in his field,and sensing his integrity were both very essential factors in making my final decision. I am grateful to Robin for his guidance and am at peace with my decision. My interview with Robin for LTC insurance was done completely by phone and internet. I found the information to be thorough and sufficient to make a decision to purchase the insurance. Thanks Robin. Robin was very thorough and helped to clarify the many aspects of Long Term insurance. I found his presentation very helpful. We feel Robin is very professional and understanding person. His patience and deep knowledge helped us to satisfy all the questions we had. Very thorough presentation. I feel like Robin had my best interest in finding the best Long Term Insurance for my purposes. I have been trying to educate myself on Long Term Care insurance, but it really came together when my wife and I discussed this with Robin. Yes, the lightbulb came on. His no pressure presentation and discussion was wonderful. I felt he was very patient with the multitude of question we had. We just received an email confirming that we were approved. What a wonderful and gratifying feeling that our assets are not only secure, but my wife and I, together or separate, will be able to obtain quality care of our choice. Thank you, Robin. I just would like to let anyone interested in having Robin help them with long term insurance. How very helpfull and patient he was with my husband and myself, he did not pressure us. He gave us time to check things, and think about things. And he was there to answer any questions we had. We are very happy that we went with Robin for this very important decision. Thank you Robin for guiding my wife and me through the long-term care application process. You were extremely helpful and I appreciate your personal motivation for wanting folks protected against the financial hardships of long-term illness and care. Thanks!!! I purchased long-term care for one reason. I want to be assured of quality care in my later years should I need it. This was made possible with one phone call to Robin. He made me realize that long-term care is a necessity. He found me an affordable policy with a reputable company. Robin is knowledgeable, professional, and passionate about helping others. With his help, I now have peace of mind knowing that I won't be a burden to my family. Thank you Robin. Robin was very helpful in explaining the advantages of long term care insurance and the details on how to accomplish obtaining the insurance. My reason was to preserve my assests for my children and their families. It was a pleasure to work with him and it leaves you with a feeling that things will be taken care of when and if the time comes that you need such care. My daughter had put me in contact with Robin as he had been successful in obtaing long term care insurance for her even though she had a pre-exting condition. Robin was extremely helpful. He carefully explained the process of obtaining insurance and the details of the policy. I would recommend that anyone considering long term care insurance work with him. I purchased long term care for several reasons. One was to be sure if I needed it I can get quality care in my later years. Also I wanted to preserve my assets for my family and not be a financial burden to my child. Robin Wing did an excellent job of finding me an affordable but very reputable policy that fit my needs. He is customer focused, professional, and caring. Robin was absolutely wonderful in obtaining a policy for me, even though I have a pre-existing condition that precluded me from being covered by some companies. He also got my Mother a policy. He is a true professional and very helpful. I looked into obtaining this type of insurance after going thru the death of a close friend with no insurance who had no choices in the quality of their end-of-life care. It is like car insurance, you hope you never need it but if you don't have it, life will not be very comfortable. Not having it could place my husband in a position of real hardship. Most people have no idea how expensive nursing homes and/or home care can be. My husband and I had discussed getting long-term care insurance many times, but never could come to a clear decision. After caring for my parents this last year and dealing with nursing home issues for the 1st time, I had no doubt that long-term care insurance was not a luxury, but a necessity! Robin was so knowledgeable and helpful. We were pleasantly surprised to find that this coverage was not nearly as expensive as we had imagined and is well worth the peace of mind. Thank you, Robin. Robin did an excellent job of walking me through the detailed steps involved. I always felt confident that he knew who I was when I called and that the advice he gave me was accurate. He's also very patient. I teach middle schoolers and have a short attention span so it helped that he was so accessible, knowledgeable and professional. The reason I investigated buying this insurance was because it was a benefit offered by a union of which I'm a member. Now both my husband AND I are covered and we can move on to other decisions in life! Specializing exclusively in long term care planning for individuals and spousal/significant other discounts; executive carve out and employee/worksite applications providing underwriting concessions and group rates; tax qualified and state partnership plans where available. Get a Quote Here or Call Robin Wing at 386-454-9464 to review available LTCI DISCOUNTS that may be available in your state.